Practical and diligent, and having a deep understanding of life, is how her grandchildren describe her. She is able to see life from their perspective which makes them reach out to her. Gauri Karmakar (75), a Bangladeshi great-granny residing in Kolkata, is mother of 4 daughters, grandmother of 6, and great-grandmother of 2. 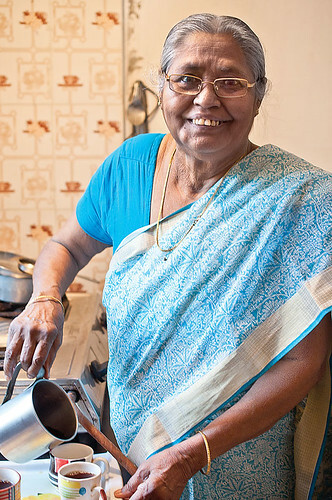 What she enjoys most is cooking, especially Bangladeshi cuisine, and continues to do so at her age. When I asked her to share a recipe, her family unanimously asked her to share the recipe of a side dish with peel of raw plantains, and she did so with great interest and patience. Since she spoke only Bengali, her young grand-daughter Madhumita happily donned on the role of a translator and efficiently translated her grandma’s responses to my questions. Namaste Gauriji. To begin, tell me about your growing years. I was born in Bangladesh, Jessore, which is in Khulna district on April 13, 1939. After the India-Bangladesh partition, we moved to Bangaon in West Bengal. That’s where I grew up and studied up to Matric (Std 10). Those days, families were large and I remember watching my elders as they worked. Both my parents passed away when I was quite young and I lived with my great-aunt for 5 years. She taught me household work and I learnt how to manage a house at a very young age. In 1953, when I was in my late teens, I got married to Bhibhutibhushan Karmakar in Bangaon itself. And when did you move to Kolkata? Yes, after my daughters were born, we shifted to Kolkata and continue to live here. Once all my daughters were married and moved away, we were just three members at home – my husband, his brother and myself. And then my husband passed away in 2010. Somehow after his demise, I grew very close to my daughters, more than I was before their marriage. I look forward to their weekend visits and cherish my time. Your family says that your most outstanding trait is your sense of responsibility. What would you say to that? I was the eldest daughter in my family as well as the eldest daughter-in-law; hence I think responsibility just became a part of my nature. It also made me a disciplinarian with my daughters. Jaya Saha (daughter): She was very strict when we were growing up, but she always gave us our space to talk about our problems to her. I guess she was over-protective of us since all of us were girls. Moumita (grand-daughter): My mother says grandma has really changed over the years and is quite accommodating now. When I decided to move to Bangalore for work, she was initially not very happy with the idea, but she did not stop me and allowed me to take my own decision. Gauriji, what do you think made the change happen? Also, if you compare life now and earlier, what changes do you perceive in general around you? Change is but natural. Times change, people change. One big difference I find is that nowadays people prefer to live alone. I think people believe in individuality now. Earlier it was all about adjusting and compromise. But I do like the fact that women are encouraged to study now since it gives them freedom. My own youngest daughter took up a job after her marriage. Madhumita (grand-daughter): She is very practical and she understands the challenges and problems of our generation, and most importantly, she is very smart. Moumita: She is diligent and hardworking. In fact, that is one quality she has imparted to her own daughters. When I see my mother now, I can imagine how hardworking grandma would have been in her earlier days! Even though she has lot of joint aches nowadays, she cooks by herself. In fact, she does not like anyone’s cooking as much as her own (laughs). She does not like eating out either. Which dishes of hers are the family favourite? Moumita: We love her cooking, especially her curries – raw jackfruit curry, raw banana peel curry and also her paneer kofta curry. Pratima Bose (daughter): She is an excellent cook, I have learnt most of my cooking from her. She believes in experimenting with food and churns out tasty dishes all the time. First published in August 2014 in Harmony – the Indian magazine for silvers for the column – The Great Granny Diaries. part-2 of this post is Plantain Peel Curry. She is the 24th grandmother featured in this column.